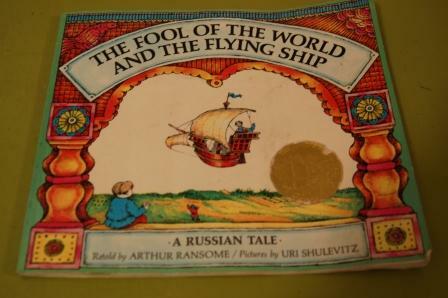 My favorite book when I was young was called, The Fool of the World and The Flying Ship, it was a gift from my grandmother. I just found it for the first time a little while ago. Having read fairy tales in my adult studies of Russian, I realized that this was an English translation of a famous Russian fairy tale. I went back through and flipped through the pages, and I remembered the magical enchanment that I felt as a child reading this book, looking at the details of the onion domed churches and bright colors and intricate embroidery on the characters’ costumes. Every thing seemed so rich and so completely different than what I could even imagine. This was my favorite book long before I had ever been to Russia. But as I made my way through Russian life as an adult, I felt that same magical enchantment. These are my photos of some of the charming little details that I found in cemetaries, on old gravestones, or on little ornamental details–all of it so rich and so foreign. One of my favorite things to do while I was studying in Moscow was taking my little Nikkomat(it was my grandpa’s SLR from the 50’s) out and about on photo excursions. I was completely charmed by Russia by the beauty of Russia before I had even set foot on Russian soil. I remember looking out the window of our airplane as we flew in to Moscow, and I could feel this kind of aching pit in my heart. As I look at the little red roofed dachas, black soil and deep green patches of forrest, I thought, “Uh-oh, I’m not going to be able to let go of this place.” And that deep, aching adoration for the place has only intensified. So here are a few of the scapes that I found so charming. Maybe it takes a fellow russophile to think so. This picture doesn’t really do it justice, but all of the old headstones are covered in a beautiful green moss. I come from a desert so moss is a strange and beautiful thing for me. 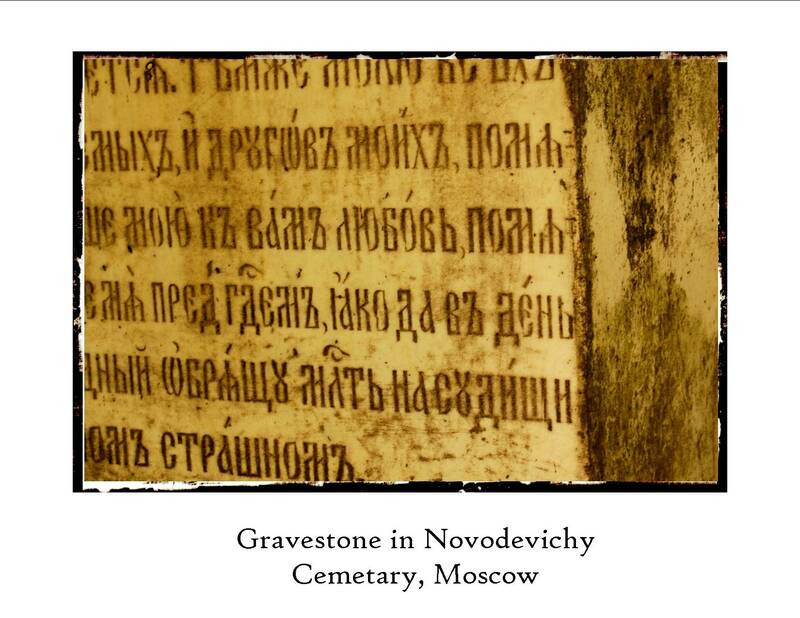 The inscription on this headstone is in old Russian(before the alphabet reform in 1919). Novodevichy Cemetery was my favorite place in Moscow. Maybe I’m morbid for think that cemeteries are one of the most beautiful and interesting places in any city, but this one is so beautiful. You learn a lot about a society from their ccemeteries. 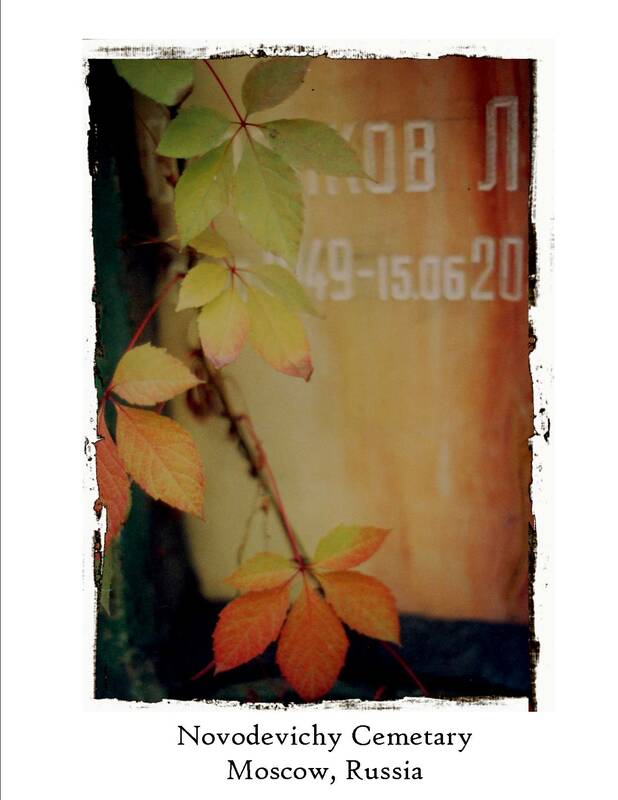 I went to Russia the first time not even knowing the alphabet , so just to see the letters engraved on headstones was rich and foreign for me. Autumn is my favorite season. I remember the first time I heard Pushkin’s name was when I was going for a walk with a Russian friend(within a month of my arrival) and I sighed and said how much I loved the fall. And Sergey replied, “Yes, Pushkin love the fall as well, he wrote many poems about it. One of my other favorite places in Moscow is ВДНХ, Выставка достижений народного хозяйства, or a rough translation: Exhibition of the Peoples Agricultural Achievments It was a place where people from the 15 different republics could come to show off their agricultural achievements. Every republic had its’ own building and they were built and adorned with ornament native to that republic. I think I’ll do an entire blog on this place sometime because it is really incredible. This is the entrance to the center. True Russian architecture is so unique and intricate. But don’t get me wrong, I am just a fascinated and impressed by that good old fashion Soviet Empire style. 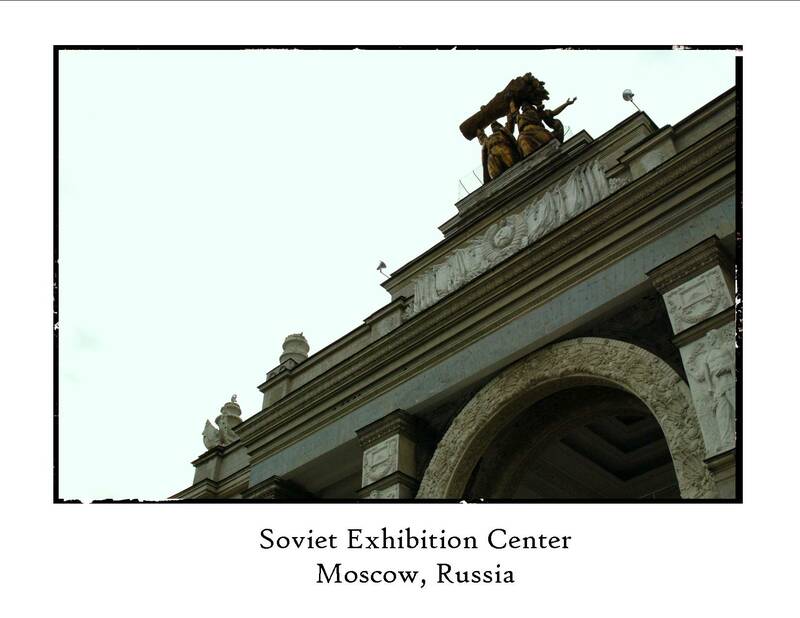 I love the drab colors and the stark grandeur of the soviet era. The ornamentation here is not frivolous, it is a celebration of socialist labor. This was where the people could come to celebrate the contributions to the mighty soviet empire. One of the most ornately designed and decorated buildings is the Ukraine building. You can by the metro station dedicated to Kiev and by this building that the Russians felt that Ukraine represented every thing that was rich in detail and culture. 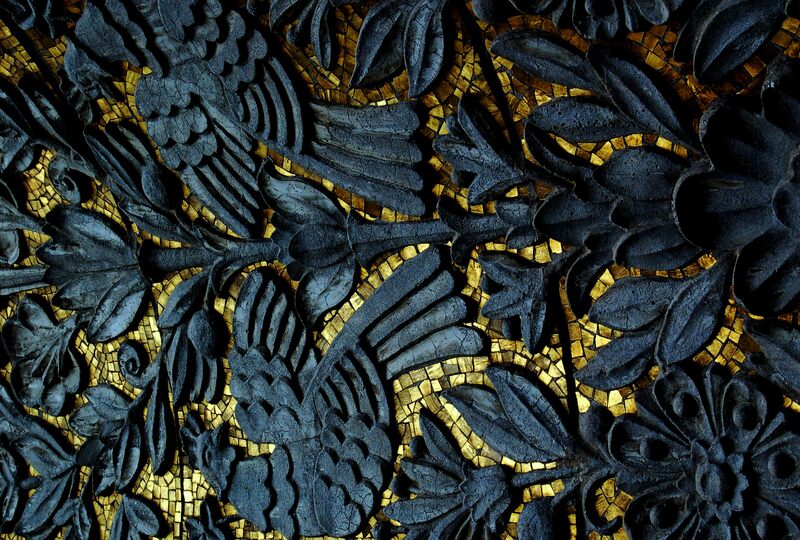 This is just a strip of mosaic that runs along the outside of the Ukraine building. 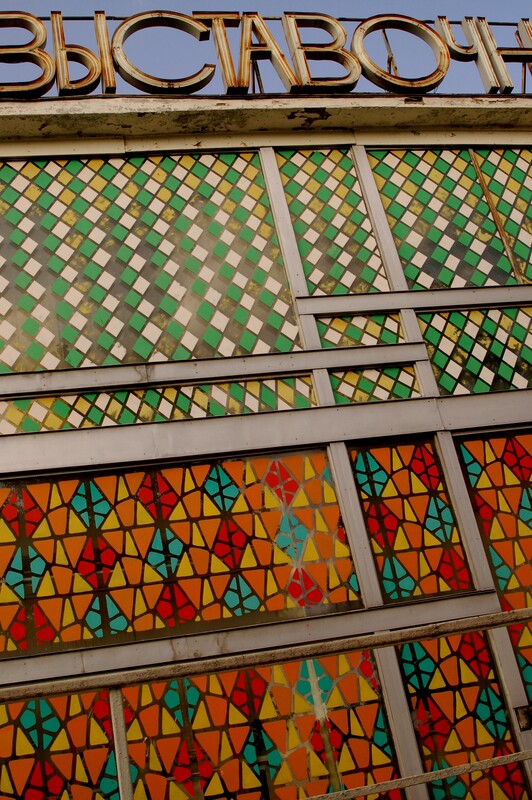 The whole building is decorated with traditional ornament and folk designs of the country. The park is huge and just when you think that you have wandered out of the park and into some far away forest, you will stumble upon yet another building with a sign that says something like “House of Honey Cultivation” or some other random aspect of agriculture you didn’t even know existed. It is kind of like a ghost town, a representation of what the country was left with after Communism. This is the side wall of a building we found way back in the forest. The building was closed up and had been vandalized. I love the colors and style. It’s so soviet and I can imagine that it must have been a very hip and exciting design, but now practically no one sees it, which is said considering that the words say “Выставочный Центр”, or “Display Center”. It is eerie to picture our bustling centers of capitalism, our triumphant symbols of all our hard work, like this…empty, useless, except to remind us that all great empires must come to an end. I just pity that the Soviets had to see it come, shine and fizzle all on their lifetime. It’s no wonder older Russians get depressed when they come to this park. So maybe in the end the cemetery was that not that different from the park. Whether it’s once inhabited bodies or buildings, I’ve always been fascinated by abandoned things and the stories they enclose. I love eerie unresolved plots and histories, and perhaps that is why I am so drawn in by Russia. Great read! I’m living my love of Russia through your experiences. Thank you for your website and for sharing your experiences.